Myles Weinstein // Unlimited Myles, Inc.
Once you have listened to acclaimed vocalist, composer and arranger Alicia Olatuja (A-LEE-see-ah Oh-la-TU-ja), you won’t soon forget her. 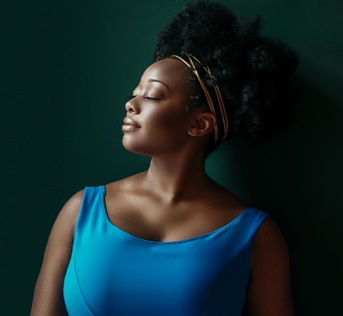 Praised in The New York Times as “a singer with a strong and luscious tone,” Olatuja combines the earthy with the sublime, bringing a grounded relatability to genres as lofty as classical, as venerated as jazz, and as gritty as R&B. 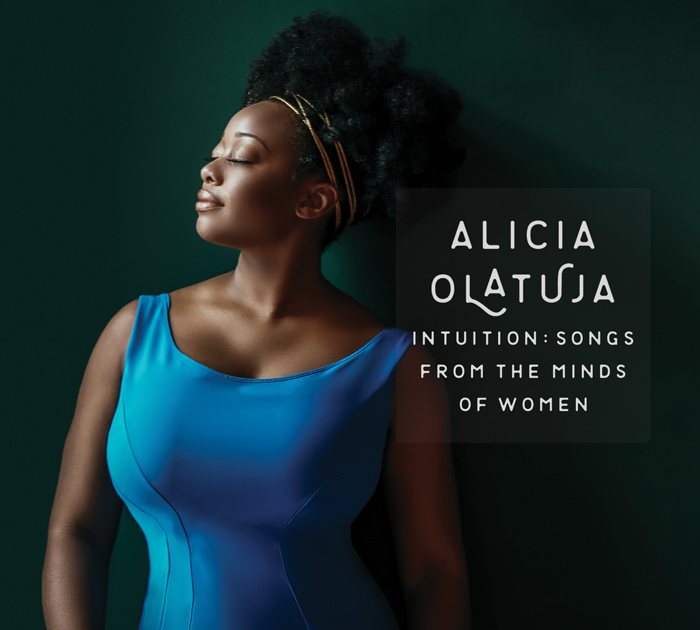 On her stunning Resilience Music Alliance debut, Intuition: Songs From The Minds Of Women, Olatuja lends her distinctive approach to celebrating the artistic output of noted female composers. 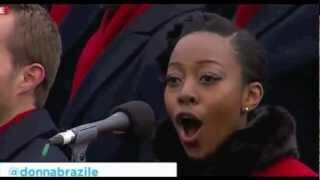 Olatuja’s vocal excellence stunned a global audience of millions during the second inauguration ceremony for President Barack Obama, the nation’s first African American president, in 2013 with a soaring featured solo during the Brooklyn Tabernacle Choir’s rendition of “The Battle Hymn of the Republic.” Though most didn’t know her name, her pristine voice and poise made a visible impact on the dignitaries in attendance, with reporters and social media lavishing her with praise. “They weren’t there to see me or anybody else sing, what brought them there was this monumental historical event, but to see their reaction was another piece of validation for me as a performer,” she says. Since this historic performance, opportunities to expand her repertoire and earn fans have only snowballed. Olatuja has performed extensively with The Juilliard School’s various jazz ensembles, shared the stage with Chaka Khan, BeBe Winans, Christian McBride, Dr. Lonnie Smith, Billy Childs, and others, and appeared at national and international music festivals with her own band, earning accolades from fans and the press. She released a previous music collection, Timeless, independently in 2014. Intuition features songs by Sade, Angela Bofill, Brenda Russell, Linda Creed, Imogen Heap, Tracy Chapman, Kate Bush, and others. Produced by Olatuja, Kamau Kenyatta and Ulysses Owens Jr., with arrangements by noted jazz musicians, Intuition is a showcase for Olatuja’s broad vocal range, deft lyrical interpretation, and elegant phrasing, a sound that may draw comparisons to current soul-pop finds like Ella Mai and H.E.R. while evoking such treasured soul divas as GRAMMY winners Lalah Hathaway, Rachelle Ferrell, and Dianne Reeves. Intuition is a perfect musical commentary for the times, as women reassert their rights, gain more political clout, and speak out against harassment, abuse, and exploitation in all walks of life. Olatuja is perfectly suited to deliver a meditation on the depth of women’s musical expression. She puts her distinctively soulful stamp on every track, giving beloved South American anthem “Grácias A La Vida” by Violeta Parra a funky update with Memphis-style horns while acing the Spanish lyrics; building bridges to the Motherland with African choruses on Angela Bofill’s “Under The Moon And Over The Sky,” and adding a Caribbean jump-up beat to the Linda Creed co-composition “People Make the World Go Round.” Her creative approach also reimagines Brenda Russell’s “So Good, So Right,” the focus track Sade Adu’s “No Ordinary Love,” Joni Mitchell’s “Cherokee Louise,” Tracy Chapman’s “Give Me One Reason,” Kate Bush’s “This Woman’s Work,” and Imogen Heap’s “Hide And Seek.” The set includes an original tune by Olatuja, as well as compositions by a new composer and an Australian colleague. The striking vocalist made sure to pick songs that represented a variety of themes, perspectives, and ages, as well as geographic areas, emphasizing the power of diversity. Originally from St. Louis, Missouri, Olatuja focused her relentless energy on music at a young age. Singing in her church choir and in various school ensembles, she was exposed to everything from gospel anthems, R&B grooves and pop fare to Latin oratorios and a cappella harmonies. Though she had planned a career in veterinary medicine while at the University of Missouri-Columbia, her music interests led to being cast as the lead in an operetta commemorating the bicentennial of the Lewis & Clark Expedition. Preparations included more than two years of intense vocal training, workshopping and live performances that only sharpened her prodigious gifts. With a Master’s degree in Classical Voice/Opera from the Manhattan School of Music in New York City, the singer has performed in regional theater, opera companies, gospel conclave and jazz festivals across the globe, returning often to Brooklyn, the culturally diverse, artistically progressive enclave that has influenced dozens of successful neo-soul, jazz, hip-hop, and rock talents. For this new project, Olatuja decided to celebrate the musical contributions of women composers by reinterpreting their songs through her own lens of classic, jazzy soul. As such, Intuition: Songs From The Minds Of Women is a dazzling journey through time, tempo, genre, language, and culture from some of the most respected women artists of our generation. With the recording initially supported through a crowdfunding campaign, the project was picked up in 2018 by the Resilience Music Alliance label and is launching in the first quarter of 2019. Thanks to her diverse musical choices and gorgeous musical interpretations, Olatuja’s Intuition is a carefully crafted statement of female empowerment at a pivotal moment in our cultural history.